Grab Bar Pros of the Lehigh Valley specializes in the installation of grab bars, interior and exterior handrails and ramps. Options for safety may include: stand-alone assist poles, handrails (exterior / interior) and grab bars around doorways, toilets, showers, tubs and other places where standing/transitioning may be difficult. Bruce will advise as to these locations which are usually anywhere there is a transition or elevation potential for tripping. This may include steps, stairs, bathrooms, and sidewalks. All may need attention and can be discussed with Bruce for options. Installing grab bars is a cost-effective way to ensure safety and avoid the consequences of a fall. When needed, a Home Safety Evaluation by a licensed occupational therapist (OT) or physical therapist (PT) can also be performed to address multiple safety concerns related to changes in mobility, vision, hearing and memory (extra fee). Grab Pros is owned by Bruce Montgomery, a registered nurse with over 30 years experience in construction. With over 16 years experience caring for people in the hospital and home setting as a nurse, Bruce understands the importance of aging in place safely, as well as the health concerns of aging people. Based in the Lehigh Valley, Grab Bar Pros serves clients throughout Pennsylvania, New Jersey, New York, Philadelphia and beyond. 90% of all grab bar project estimates can be done over the phone and installed in one visit, saving you time & money! Call Bruce for a free estimate 610-393-6395. Bruce is the expert of choice used by local hospitals, skilled nursing centers, rehabilitation centers and home health agencies to install grab bars in patients' homes. "Bruce showed up on time. After giving me his suggestions, he installed 2 bars very securely into my shower. He cleaned up afterward. He even changed a light bulb and took my trash out for me. 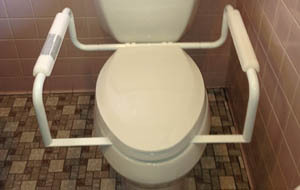 I would suggest Grab Bar Pros to anyone thinking about safety in the home." "The placement of the bars was an excellent choice and the workmanship on installing on the tile surface was very good." 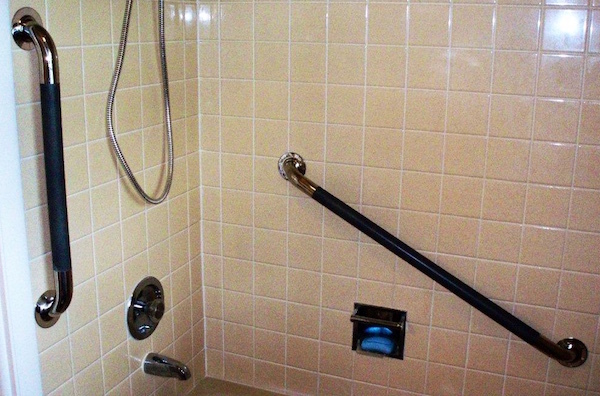 "We have a fiberglass shower that no one else would install a grab bar in. Grab Bar Pros found a way to install it into the studs and we couldn't be happier!" 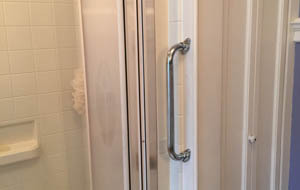 Grab bar installation in and around showers and bath tubs. We can install on fiberglass showers, ceramic and porcelain tile, and other substrates. Along front walkways, steps, porches, back decks and patios. 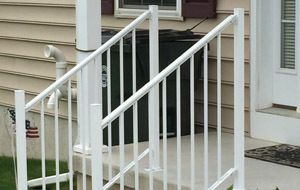 We can install wood and metal railings. Toilet areas can be hazardous in the bathrooms. We can supply and install numerous options to fit the needs of your bathroom.